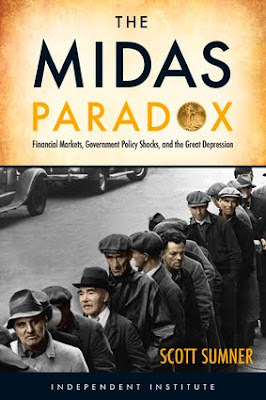 I have been enjoying Scott Sumner's history of the Great Depression, The Midas Paradox: Financial Markets, Government Policy Shocks, and the Great Depression. Sumner provides a key ideas summary for the book here. The book is an examination of dramatic macroeconomic instability under a gold standard. In The Midas Paradox, Sumner gives the gold/currency ratio (the ratio of gold reserve to currency) central place in his analysis. A gold standard sets a value in gold to the unit of account, making gold the medium of account. So, no matter how many (for instance) currency dollars are in circulation, the value of gold sets their value. If gold rises in value (relative to output of goods and services, hereafter just output), the value of money rises relative to a given level of output (so there is deflation or a falling price level). If gold falls in value (relative to output), the value of money falls relative to a given level of output (so there is inflation or a rising price level). Hence prominent interwar Swedish monetary economist Gustav Cassel's post-WWI concern about the future path of gold supply not keeping up with the future path of output, for if output growth systematically outstripped gold production, that would systematically raise the output-value of gold, having a deflationary effect, i.e. driving down the price level, driving down expenditure, and so incomes, and increasing the burden of debts. For deflation comes in three varieties; the good (falling prices due to increased productivity, such as in the IT industry), the bad (a fall in spending, relative to output, pushing down incomes, and raising debt burdens) and the ugly (such sharp shifts to holding money that expenditure collapses, so do incomes, massively increasing debt burdens, leading to a surge in bankruptcies and bad debts and so to financial crisis). Insufficient gold production turned out not to be a problem and, while fluctuations in the relative paths of gold and output did produce inflationary and deflationary swings in the C19th, they were relatively minor. Indeed, the upsurge in demand for gold from the French/German/US switch to the gold standard in the 1870s was more important. 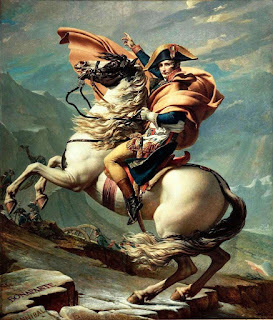 (The French/German switch is discussed here [pdf], the US switch here [pdf].) Over the course of the C19th, the inflationary and deflationary swings from shifts in the relative path of output and gold production cancelled out. Hard money man on horseback. Why would the gold/currency ratio matter? (2) The output-value of gold. Having more gold in the vaults than is needed to ensure the plausibility of the peg tends to raise the value of gold relative to a given level of output. And the more so, the more so. Since the central banks so dominated gold holdings in the interwar period, they dominated the output-price of gold, with the gold/currency ratio being an indicator of their "gold stance". A factor enhanced if private folk began to also hoard gold. Yes, central banks had a big effect on the real demand for gold, and hence the value of gold. They held a large proportion of all gold mined since the beginning of time (I think over 50%.) The real demand for gold is equal to the gold ratio times the real demand for currency. So if the public’s real demand for currency is stable, and the gold ratio rises by 9%, then the real demand for gold rises by 9%. This reduces the global price level by 9%, ceteris paribus. It’s roughly what happened between October 1929 and October 1930. After that, big rises in the real demand for currency created a higher derived demand for gold. Which pushed the gold-standard price level down further. The real demand for money is defined as the nominal [face value] amount of money demanded divided by the price level. In other words, real demand is demand in terms of output, as the nominal value of total production is output x the price level, so dividing the money value of production by the price level leaves us with output. This is what statistical authorities such as the ABS do to calculate real GDP and so economic growth. They assemble statistics on money value of production and use various price deflators to calculate shifts in actual output of goods and services. In The Midas Paradox, Scott Sumner uses as simple model to analyse the operations of the gold standard. The nominal value of the gold stock (Gs) = the Price level (P) x the real demand for monetary gold (g). Since, if you divide by prices, you are left with output or output-value. an increase in the price level [P] can be generated by one of three factors: an increase in the monetary gold stock, a decrease in the gold reserve ratio, and/or a decrease in the real demand for currency. The rate of inflation [i.e. rate of change of P] is the percentage increase in the gold stock [Gs], minus the percentage increase in the gold reserve ratio [r], minus the percentage increase in the real demand for currency [md]. At this level of abstraction the term "gold standard" simply refers to a monetary regime where the nominal price of gold is fixed. 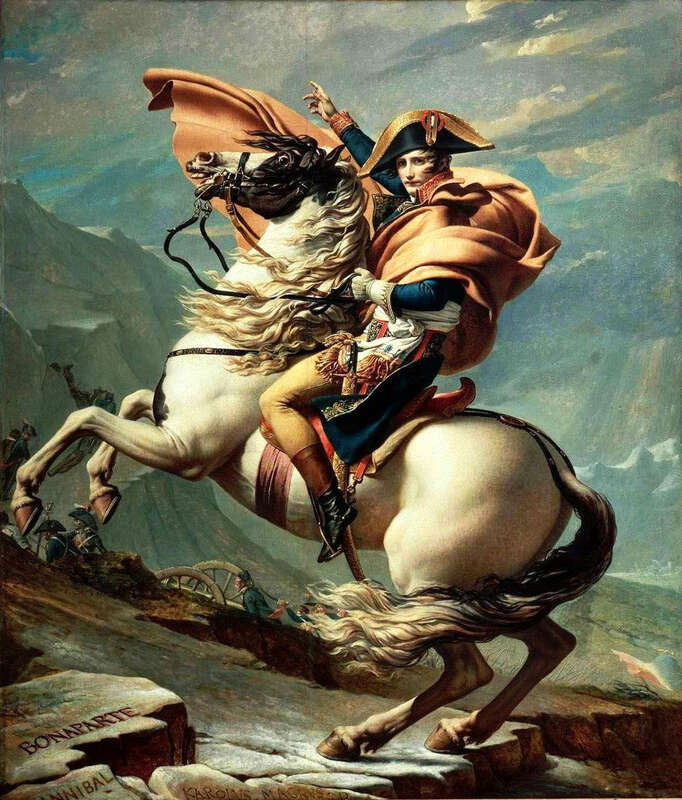 As long as the nominal price of gold is constant and the real value of gold is set in free [i.e. competitive] markets, then we can apply the gold standard model without making any further assumptions about policymakers following "the rules of the game"; that is, we do not need to assume a stable gold reserve ratio, or in fact any relationship between the monetary gold stock and the currency stock (Pp28-9). Which does simplify analysis greatly. So the model Sumner provides does what good models are supposed to do--make analysis of the phenomenon more tractable. As central to having a gold standard is to create a stable value for money--and so a stable price level--by setting a gold value to the unit of account, shifts in the price level will reflect directly shifts in the output-value of gold. In his specific response to my original comment, Sumner is being more explicit about the mechanics and invoking the above equations and explanations from The Midas Paradox. Chart courtesy of Marcus Nunes. In The Midas Paradox, Scott Sumner elucidates the central story of the Great Depression as it has been developing in the economic literature. That is, a story of disastrous central bank monetary policies, particularly by the Federal Reserve (the Fed) and the Bank of France. In the case of the US, FDR actually pulled the US out of the Depression with his unconventional monetary policy and then put the US right back into economic stagnation with his National Industrial Recovery Act (NIRA), a strong negative supply-side policy shock to the economy. When the US Supreme Court struck down NIRA as unconstitutional, economic recovery picked up again, until further destructive monetary policies (pdf) created the severe 1937-38 downturn. So, it was all about bad public policy, not some inherent problems with capitalism or market economies. And in The Midas Paradox, Scott Sumner takes us through the twists and turns of that. Some of that has good explanatory power (e.g., at explaining the Hoover recovery, some of the Four Glorious Months of 1933 [April, May, June, July]), but 1937 or the WWI inflation need more explanation. Also, I never realized how much gold flowed into the U.S. in WWII. What was going on with other gold standard countries also mattered -- given there was effectively a global market for gold. Also, Sumner makes the point that context matters hugely. Lorenzo, you forgot, for the chart: "Courtesy of Marcus Nunes"! First, the worse of the Depression was about the time FDR took office (bank runs). Then the GD burned itself out despite what FDR did, not because of it, and finally, the severe 1937 downturn had little or nothing to do with monetary policies, see: Did the Reserve Requirement Increments of 1936-1937 Reduce Bank Lending? Evidence from a Natural Experiment∗ HAELIM PARK and PATRICK VAN HORN Article first published online: 28 JUL 2015. Ray: (1) abuse isn't argument. 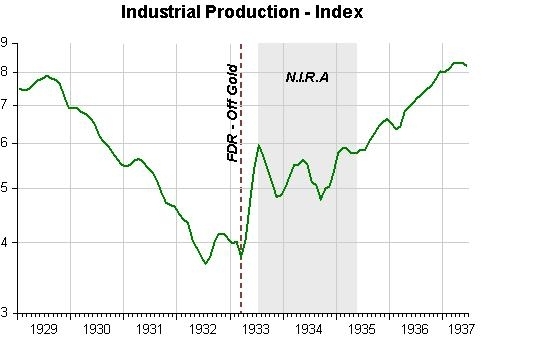 (2) It is very unlikely to be a wild coincidence that the fastest rate of increase in industrial production in US history occurred after FDR went off gold. 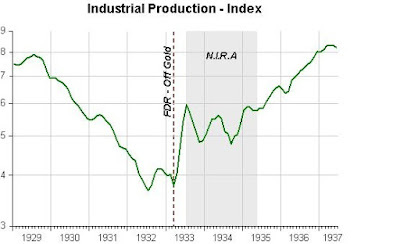 (3) It is well established that economies started recovering from the Great Depression as they left the gold standard. (4) Gold sterilisation was monetary policy, and it had a great deal to do with the 1937 recession. (5) Of course the Supreme Court ruled against NIRA on legal grounds, that's what courts do. But laws have economic consequences, particularly such a far-reaching and unusual law such as NIRA.